Outside the Plymouth Trial Court building. 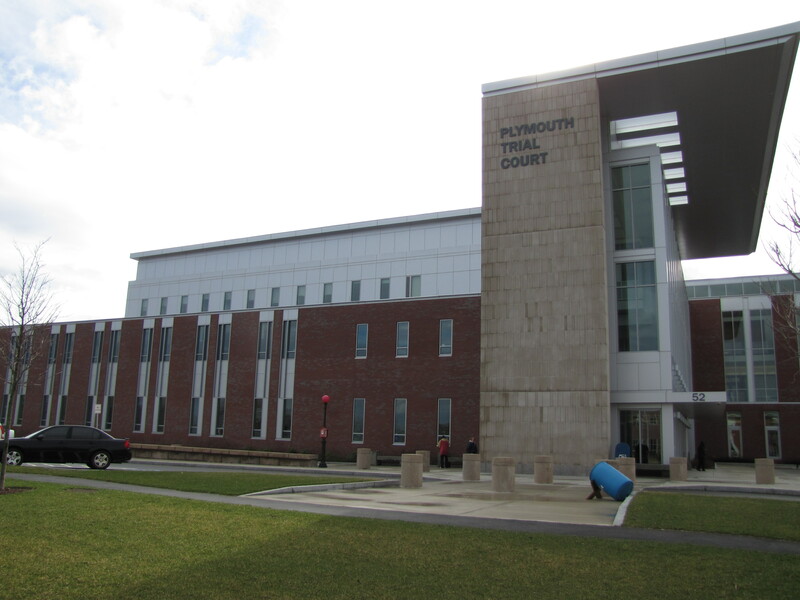 Jurors will continue deliberations in the Bouchard 120 oil spill trial today at Plymouth County Superior Court. Stay tuned to ThreeBeats for news about the eight expected verdicts. Meanwhile, read Becky W. Evans’ coverage of Wednesday’s proceedings here on ThreeBeats and in The Standard-Times, The Cape Cod Times and The Boston Herald. 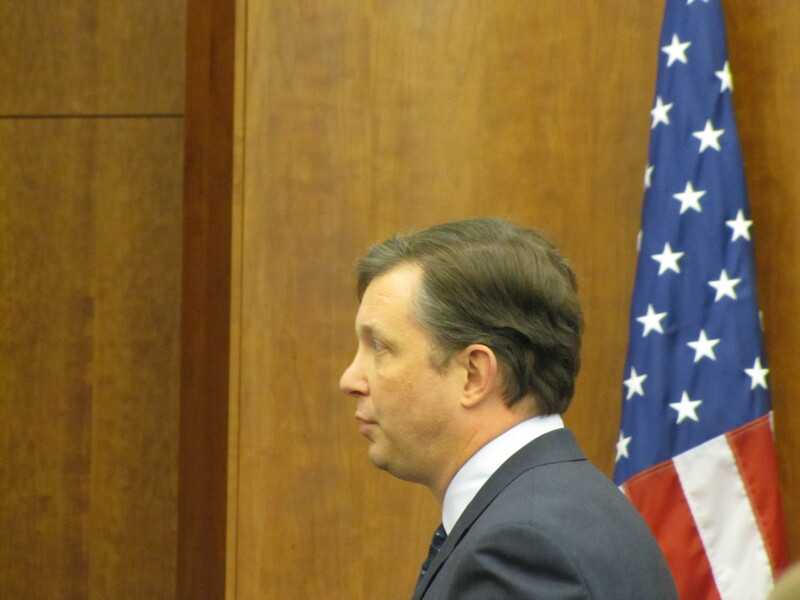 Defense attorney Ronald W. Zdrojeski makes closing remarks to the jury. PLYMOUTH— Capping off six days of testimony, lawyers made closing statements to jurors Wednesday during a class-action trial involving eight Mattapoisett property owners whose beaches were polluted when a Bouchard barge spilled up to 98,000 gallons of oil in Buzzards Bay on April 27, 2003. The 13-member jury, which began deliberating the case Wednesday afternoon, must decide how much, if any, in damages Bouchard must award to each of the eight plaintiffs. The trial at Plymouth County Superior Court is likely the first of many trials in a class-action lawsuit that 1,100 Mattapoisett property owners filed against Bouchard in September 2004. Jurors will issue eight verdicts, one for each property owner. Each verdict will require an agreement by 11 out of the 13 jurors, Justice Raymond J. Brassard said. 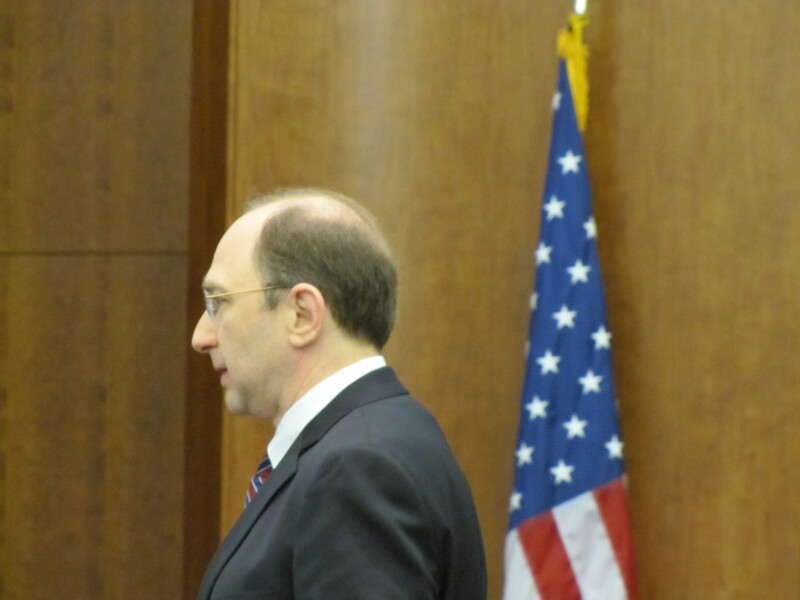 Plaintiffs' attorney Martin E. Levin makes his closing statements to the jury. “The defendant took something special away from the homeowners, their right to use and enjoy their beach without interference from oil that should never have been there and would not be there if not for the defendant’s negligent grounding of that barge,” said Levin, who works for Boston law-firm of Stern, Shapiro, Weissberg & Garin LLP. Levin said the jury should decide how long the beaches were polluted based on evidence from property owners who testified during the trial. He suggested jurors consider awarding damages greater than or equal to the appraiser’s “conservative” findings for lost rental value, which ranged from about $5,000 to $60,000 per property. He asked the jury to consider whether “a reasonable person” could have used the plaintiffs’ beaches following oil spill cleanups that were overseen and approved by government agencies. He said all the beaches were open for public use by Memorial Day weekend in 2003. “The reality is the beaches were never closed,” said Zdrojeski, who works for Robinson & Cole LLP of Hartford, Conn. In place of those figures, he suggested that jurors award $200 to six of the eight plaintiffs who were “inconvenienced” by the spill. For the remaining two plaintiffs, he suggested that Bradford Chase of 15 Seamarsh Way receive $500 in damages for “traces of oil on his property.” He suggested awarding $3,000 in damages to Francis Haggerty of 126 Brandt Island Road near Leisure Shores beach. He said that amount would give Haggerty $500 for each of the six years that residual oil affected his use of the beach. Following the closing statements, Brassard gave instructions to the jury to guide their deliberations. “Your duty is to return the right verdict, the truthful verdict,” Brassard told the 13 jurors. Two of the original 15 appointed jurors dropped out during the trial due to personal reasons. Both Bouchard and the mate of the Tug Evening Tide, which was pulling the barge, pleaded guilty to violating the Clean Water Act and killing 450 birds. Bouchard paid the federal government $9 million in criminal fines, while mate Franklin Robert Hill served six months in federal prison.